The following detailed step by step guide will help you jailbreak iOS 4.3 Beta on iPhone 4, iPad and iPod touch 4G using PwnageTool bundles. Cydia is fully working on iOS 4.3 Beta. WARNING: The jailbreaking procedure is complex, and hence is meant for advanced users only. It will require you to make your own ramdisk because the latest official version of PwnageTool makes a broken one for iOS 4.3. Proceed at your own risk only. We are not to be held responsible if you end up bricking your iPhone, iPad or iPod touch. Step a) Download PwnageTool bundle according to your iOS device and extract the zip file. 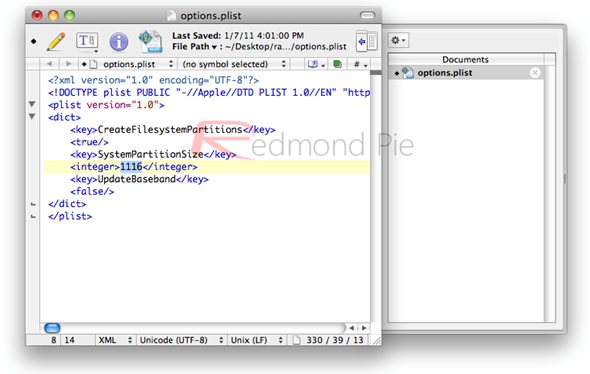 You will see that there are these two files: CydiaInstaller.bundle and a .bundle file. For this tutorial, we will use iPhone3, 1_4.3_8F5148b.bundle. Place all these files to your desktop. Step b) Now Download PwnageTool 4.1.2 put in on your desktop. Right click on it and then click “Show Package Contents”. See the screenshot below. 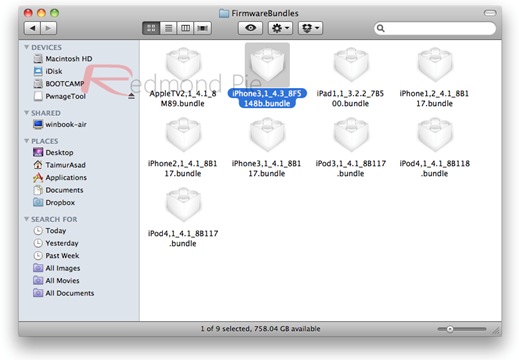 Step c) Navigate to Contents/Resources/FirmwareBundles/ and copy/paste iPhone3, 1_4.3_8F5148b.bundle file here. 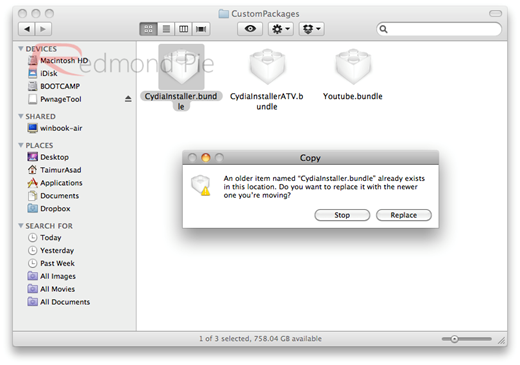 Step d) Now navigate to Contents/Resources/CustomPackages and here copy and replace the CydiaInstaller.bundle file here with the one you downloaded in the Step a. Step e) Now, download iOS 4.3 Beta on your desktop. Step h) At this point, check “Build” and click next to start cooking the custom firmware. 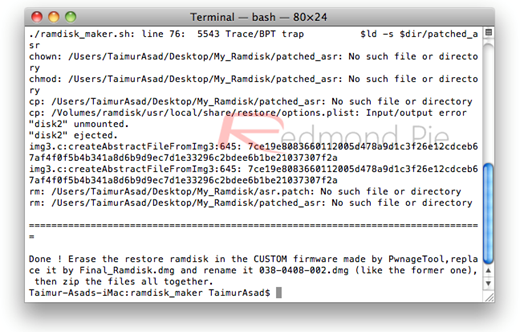 Step i) Wait while PwnageTool customizes the firmware that you can restore to your iOS device to jailbreak it. Step j) When done, close the PwnageTool. Do not restore the firmware yet because there are few more things you need to take care of. 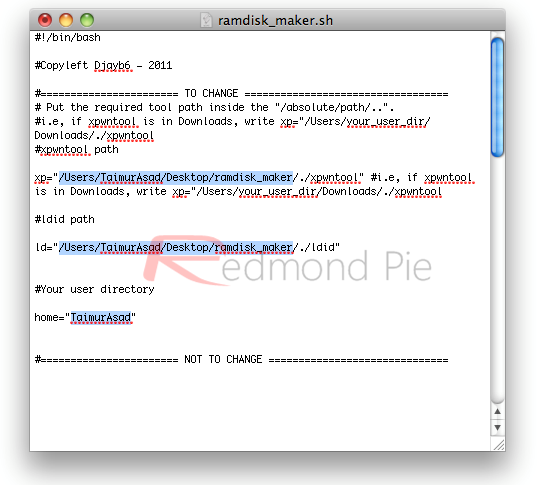 Step k) Download the Ramdisk_Maker.zip by DjayB6 (Click here to Download). Unzip the files and put them on your desktop. 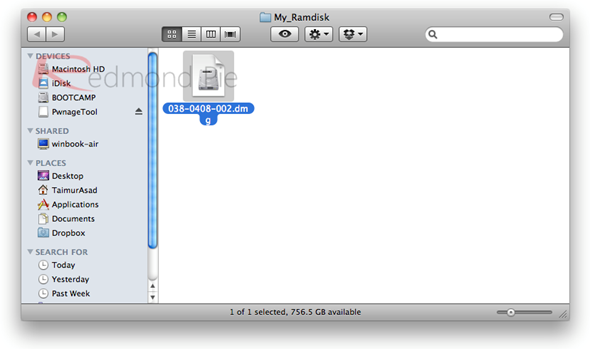 Step l) Create a folder on the desktop named My_Ramdisk. 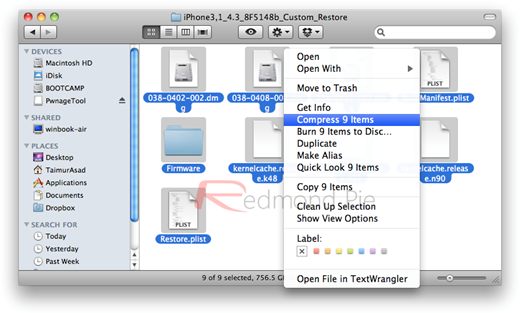 Extract the contents of iOS 4.3 by first changing the file extension from .ipsw to .zip. Step m) There will be a file named 038-0408-002.dmg. 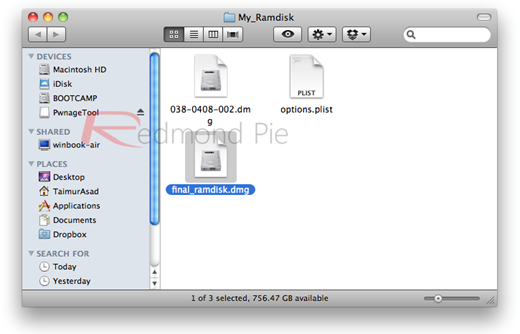 copy this file to My_Ramdisk folder that you made in Step l.
Step p) Save the file and move it back to the My_Ramdisk folder. You will notice again that the Terminal is doing something. It will actually notify you about completing the process. 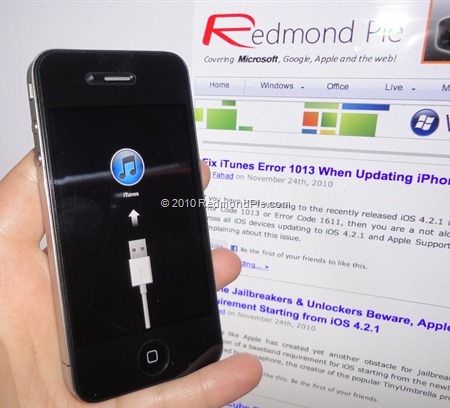 Step r) Extract the contents of the custom iOS 4.3 Beta firmware file that you created in previous steps by changing it’s extention from .ipsw to .zip. Now change the extension of the custom iOS 4.3 Beta firmware file that you created earlier from .ipsw to .zip, and then extract this .zip file. 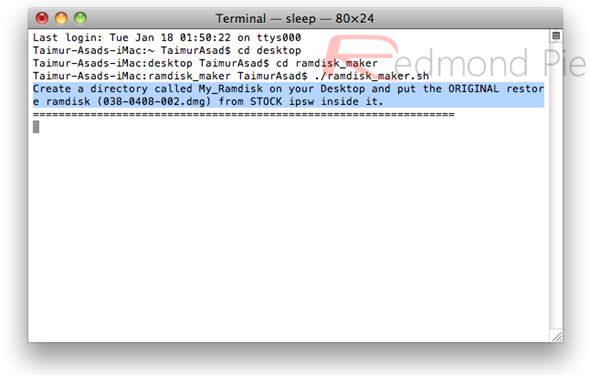 Inside the extracted folder, replace the 038-0408-002.dmg file with the one you created in Step q. Step s) Select all files in this folder and then click “Compress 9 Items” that will create a .zip file. Change the extension of this .zip file to .ipsw file. This is your final custom firmware. 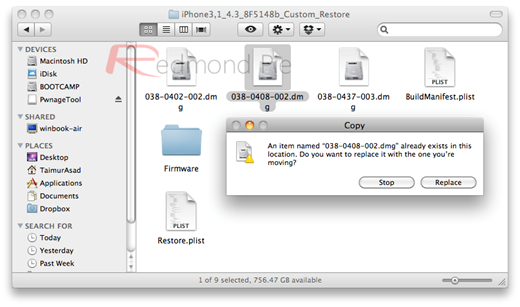 Simple restore this firmware using iTunes to your iOS device. To do this, connect your device while running iTunes and your iOS device will appear in the sidebar. Click on it and hold “alt” key in Mac or “Shift” key on Windows and press “Restore” button. When the file browser opens, select the custom .ipsw that you recently created and let iTunes restore the device. When done, your iOS device will boot to a jailbroken state. 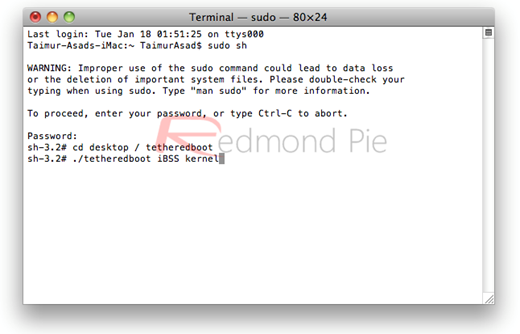 Step t) Click here to Download tetheredboot.zip utility for Mac OS X , extract the .zip file. Step u) Get these three files from the original iOS 4.3 firmware: kernelcache.release.n90, iBEC.n90ap.RELEASE.dfu, and iBSS.n90ap.RELEASE.dfu. by extracting the contents of .ipsw. You can do it by first changing the file extention from .ipsw to .zip and then extracting the .zip file. You will notice some scripts running in the Terminal Window. Keep your eyes on it until it asks you to enter your device into DFU mode. To enter your iOS device in DFU mode, Press and hold “Home” and “Power” button together for about 10 seconds and then release “Power” button but keep holding the “Home button”.